In The Last of the Doughboys, Richard Rubin introduced listeners to a forgotten generation of Americans: the men and women who fought and won the First World War. Interviewing the war's last survivors face-to-face, he knew well the importance of being present if you want to get the real story. But he soon came to realize that to get the whole story, he had to go Over There, too. Would you listen to Back Over There again? Why? YES---AS SOON AS I FINISH. IT'S LIKE A GREAT FILM THAT THE MORE YOU SEE, THE BETTER YOU LOVE AND UNDERSTAND. THE NARRATION IS DEEPLY RESPECTFUL OF THE AMERICAN SERVICE MAN. BECAUSE DE GUALLE HATED AMERICANS SO MUCH, I THOUGHT ALL THE FRENCH THOUGHT OF US AS BIG LOUD MOUTH SOLDIERS. THE FRENCH TRULY CARE ABOUT, AND LOVE--AND MEAN LOVE--WHAT THE DOUGHBOY, SAMMIES DID IN FRANCE, FOR FRANCE IN 1917 AND 1918. What does Richard Rubin bring to the story that you wouldn’t experience if you just read the book? HIS UNIQUE VOICE. MANY TIMES I PREFER A PROFESSIONAL. THIS IS DIFFERENT. I FEEL LIKE I'M WALKING RIGHT BEHIND HIM ON THE BATTLEFIELD, FALLING IN FOXHOLES, STUMBLING OVER MESS KITS AND BARBED WIRE.. 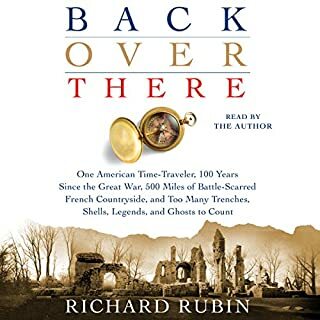 PLEASE, PLEASE, PLEASE, RICHARD RUBIN, DO A "BACK OVER THERE" FOR THE SECOND WORLD WAR! 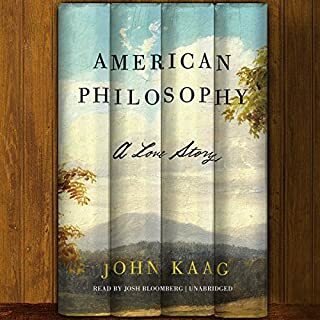 In American Philosophy, John Kaag - a disillusioned philosopher at sea in his marriage and career - stumbles upon a treasure trove of rare books on an old estate in the hinterlands of New Hampshire that once belonged to the Harvard philosopher William Ernest Hocking. The library includes notes from Whitman, inscriptions from Frost, and first editions of Hobbes, Descartes, and Kant. As he begins to catalog and preserve these priceless books, Kaag rediscovers the very tenets of American philosophy. If you could sum up American Philosophy in three words, what would they be? HEIDGIGER AND THE WHOLE GERMAN CROWD ARE A FOOT NOTE TO US. IF YOU'RE AFRAID OF PHILOSOPHY AND YOU WANT AN ABSOLUTELY PAINLESS INTRODUCTION TO MODERN PHILOSOPHY--EUROPEAN AND AMERICAN--READ THIS. If you could sum up Passchendaele in three words, what would they be? PAUL HAM FFORTLESSLY MOVES AMONG THE FRONT LINE SOLDIERS, (BOTH SIDES) GENERAL HAIG, PRIME MINISTER DAVID LLOYD GEORGE AND THE OMNIPRESENT ENEMY, THE GERMANS. SAME GREAT QUALITY AND TONE, IT'S LIKE WATCHING A VERY SAD AND TRAGIC MOVIE. 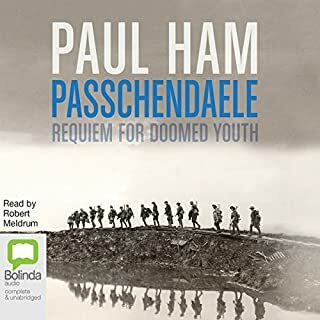 GRIEF AT THE TERRIBLE SWAMP OF PAIN AND DEATH AND MUD AND GAS AND GORE OVER SUCH A TENDER, EMOTIONAL NAME, PASSCHENDALELE. NOTHING. THEIR BEAUTIFUL GREEN LOVELY ISLAND, THIS HOME, ENGLAND WITH THEIR SISTERS, BROTHERS, AND MOMS AND DADS WAS SAVED. 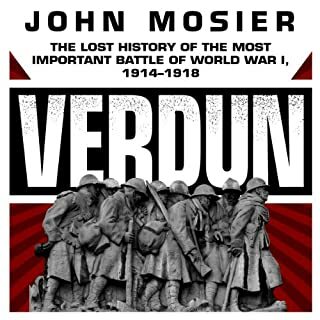 Would you consider the audio edition of Verdun to be better than the print version? I FINALLY UNDERSTAND THE MANY, MANY BATTLES OF VERDUN. IT TRULY IS A LOST, VERY LOST HISTORY. THE BOOK COVERS EVERY BATTLE FROM 1914 TO 1918.I BOUGHT TO HARDCOVER EDITION FOR THE MAPS.BUT THE MAPS ARE AWFUL AND NOT ENOUGH OF THEM. PETAIN--ARROGANT-WOMANIZER-ASTUTE AND LOVING COMMANDER (AND I DO MEAN LOVING) STANDING BY THE SACRED WAY WATCHING HIS FRENCH SOLDIERS TRUDGE INTO THE BATTLE. :NO WONDER THAT THEY LOVED HIM BACK. YES, EXCEPT WHEN HE GOES OFF TOPIC OR TOO DEEP INTO NON BATTLE TOPICS EG THE TRUE NUMBER OF CASUALATIES ON BOTH SIDE ETC. HIS OBVIOUS GERMAN SYMPATHIES STUCK IN MY CRAW---I.E. THEY ONLY WANTED PEACE THAT'S WHY THEY INFLICTED THE WORSE BARRAGE IN HISTORY, PHOSGENE (POISON GAS) AND FLAME THROWERS ON THE FRENCH.AT VERDUN. IF THEY WANTED PEACE SO MUCH WHAT IN SAM HILL ARE THEY DOING 30 MILES FROM PARIS? WE WOULD FIGHT TOO, IF THEY WERE 30 MILES FROM WASHINGTON.BUT FOR THAT--I DON'T THINK HE WRITES AS WELL AS ALISTER HORNE WHO WROTE THE CLASSIC VERDUN ACCOUNT, BUT AT LEAST I COULD UNDERSTAND EVERYTHING--DESCRIBING THE MANY FRENCH FORTS AS A BATTLE SHIP BURIED IN SAND AND THE FRENCH TOWN OF FLUERY AS A RUBBLE HEAP WITH A SIGN, OR THE VAUQUOIS (ANOTHER BITTERLY FOUGHT OVER FRENCH TOWN) AS LOOKING LIKE A CHILD'S SAND CASTLE STEPPED ON, I CAN'T GET OUT OF MIND. AND HE HAS THESE LITTLE GEMS, LIKE ON EVERY OTHER PAGE.WONDERFUL BOOK!!!!!!!!!!!!!!!!!!!!! What did you love best about Hitler's Hangman? I LOVED THE PERSONAL ANECDOTES WHICH WERE FAR AND IN BETWEEN. FOR EXAMPLE, THE MORNING BEFORE HIS ASSASSINATION, HE WAS PLAYING WITH HIS THREE CHILDREN. MORTALLY WOUNDED, THIS FANATICAL NAZI SOLDIER GOT OUT HIS CAR AND CHASED ONE OF THE ASSASSINS ON FOOT UNTIL HE COLLAPSED IN FRONT OF HIM. HIS WIFE---VERY LITTLE ABOUT HER TOO MUCH ABOUT THE WORKAHOLIC MURDERER'S SCHEDULES AND MEETINGS AND SPEECHES AND ARTICLES. SHE WASN'T THE COMPLACENT NOT GET INVOLVED IN YOUR HUSBANDS LIFE NAZI WIFE. AFTER HE DIED SHE WAS SUEING AND WINNING CASES AGAINST THE GERMAN FEDERAL GOVERNMENT AND EVEN WROTE HER AUTOBIO--"MARRIED TO A WAR CRIMINAL." Which character – as performed by Napoleon Ryan – was your favorite? 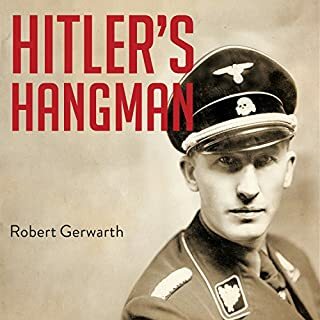 I HAVE NEVER HEARD HEYDRICH SPEAK BUT WITH A THE SLIGHT, VERY, VERY SLIGHT EMOTIONAL LISP HE DID THE HANGMAN'S VOICE PERFECTLY. HE ALSO DID THE VERY BEST HITLER VOICE I'VE EVER HEARD---AND WE HAVE ALL HEARD HITLER AND SEEN THE MANY DOCUDRAMAS. YES!!! AFTER VIEWING THE ACTUAL SITES WHERE THOUSANDS OF HIS HELPLESS VICTIMS HAVE BEEN HEARTLESSLY MURDERED, HE GOES OFF TO PRACTICE FOR THE FENCING (SWORD FIGHTING) COMPETITION WHERE HE PLACED FIFTH. TOO MUCH HOLOCAUST. THE TOPIC HAS ALREADLY BEEN COVERED VERY, VERY WELL BY MANY, MANY SCHOLARS. I FEEL I MISSED THE ACTUAL MAN. BUT THE BOOK IS EXCELLENT AND VERY WELL RESEARCHED AND I WOULD RECOMMEND THE BOOK TO ANYONE. HIS HISTORICAL JUDGMENTS ARE PERFECT. HIS VALUES FROM THE A NON NAZI- WESTERN VIEW WERE NEVER UNFAIR--IF ANYTHING VERY, VERY FAIR TO HEYDRICH I.E. THROWN OUT OF THE NAVY (HIS LIFE AND DREAM) MADLY IN LOVE WITH LENA, HIS FANATICALLY NAZI WIFE, HE BECAME A NAZI TOO. BUT WHY DID HE BECOME A MASS MURDERER? WHAT WAS HITLER'S STRANGE SPELL? THERE WAS NOTHING IN THIS GIFTED VIOLINIST PAST TO EXPLAIN THIS. HIS PARENTS WERE GOOD NON "JEW HATING" CARING GERMAN PARENTS. HE WASN'T IN THE FIRST WAR AND NEITHER WAS HIS FAMILY. I DID BREATHE A SIGN OF RELIEF WHEN I FINISHED THE BOOK: THANK GOD HEYDRICH AND HIS KIND DID NOT WIN THE SECOND WORLD WAR. If you could sum up To End All Wars in three words, what would they be? If the Germans had pushed the British INTO THE SEA (3 words)--PERSONALLY ON A DAY TO DAY LEVEL-- what would have happened to us Americans-- you, Adam Hochschild, ME? Good grief! ALL THE WOMEN: Emmeline Pankhurst, Charlotte Despard and all the Suffragists. He was very good. For me the book with its painful descriptions of a battlefield out of Dante's Inferno (in the rain) I wish he had been more emotional. I'm not sure they allow that in a political and military history. YES! But the author had two books in one and the British military history was the pilot fish and simply didn't belong. BUT THE MILITARY HISTORY WAS THE BEST PART.. It's the first time I've said this about a military history: it was BEAUTIFULLY written. There were embarrassed tears for me as I read of the Indian cavalry and their poor horses riding into bullets. A British soldier stuck in mud, driven insane over four days impossible to save. Sir Arthur Conan Doyle for years trying to contact his son in seances. Empire loving Rudyard Kipling driven half insane upon losing "my son Jack." A mother who writes letters to a son months after she knows him to missing and killed. 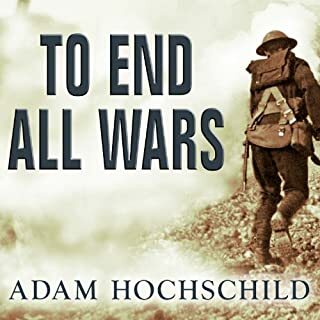 Adam Hochschild unintended, subliminal message is that the British soldier stuck in that sticky, stinking, gas poisoned, feces and body parts filled mud--DIED FOR NOTHING in hopeless attacks, led by that dumbest donkey, General Haig. But there is another STORY in all that gory detail. They didn't quit. 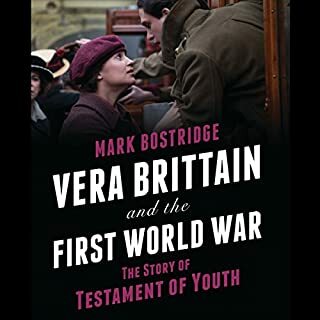 Vera Brittain and the First World War tells the remarkable story of the author behind Testament of Youth while charting the book's ascent to become one of the most loved memoirs of the First World War period. Such interest is set to expand even more in this centenary year of the war's outbreak. If you could sum up Vera Brittain and the First World War in three words, what would they be? Two words: SO YOUNG! Vera and her brother Edward, and her fiance, Roland, and Victor and Jeffery were children fighting (Edward--a captain was 22 when he was killed and the rest as young) fighting a World War. What was one of the most memorable moments of Vera Brittain and the First World War? Poor dear Edward whom Vera loved beyond words--even more than the handsome wise talented Roland--turned this biography of Vera into a tragic mystery novel and the author into a detective. But I don't want to spoil the moment. Vera writing the Testament of Youth with two babies on her hip living the life of a modern single mommy (George is gone half the year). Everybody dies-- like a terrible tragic Greek play--Roland, Jeffery, Victor, Edward all at once and then her father and Winifred almost in the same month and finally Vera losing her precious, beautiful mind asking "Who is Roland?". Vera hated her son. Her daughter Shirley did her best to keep family skeleton (Uncle Edward) in the closet. Now read Testament of Youth but skip the first 100 pages--it takes Vera that long to get to the War. The ending of the book, you can skip that too. To Vera's complete frustration, George, her husband. forced her to edit himself out of the book but for his name. Watch the BBC Vera Brittain Teleplay--but the major players are all too old for their parts--Vera is 29. In real life, Vera and her brother and three friends were teenagers, just out of high school (public school over there). The latest movie pictured on the cover is too slick, too romantic--too much Roland and not enough Edward, whom Vera and her Father grieved for every single day, He commited suicide and she had her ashes spilled on his grave somewhere in the freezing Italian Alps. Very good narrator and very clear explanations of complex issues. He breaks up the narration with BACKGROUND so that you never become overwhelmed with detail. 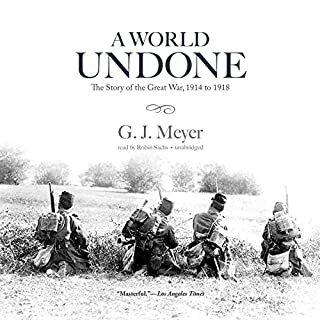 What other book might you compare A World Undone to and why? "Inferno" which is a history of WW2 by Max Hastings. They both bring CLARITY (but they don't simplfy) international relations and battles. Yes I love his tone---a little sad at the immense tragedy of the war. He concludes with "but that is another story." I sorely hope he writes that story. Not a another PHD history TEXTBOOK! If you could sum up A Storm in Flanders in three words, what would they be? It was like watching a movie in my head. What was one of the most memorable moments of A Storm in Flanders? The description of the Slaughter of the Innocents: the 17-19 year old German teens and students hooking arms as they charged into the lines of professional, sharpshooting BEF (British Expeditionary Force) solders who fired so fast i.e.over 15 rounds a minute, the Germans thought it was machine guns. Worse, each bullet was directed fire--aimed. What about David Baker’s performance did you like? Yes, but I resisted because it was so good. I've studied this battle, really battles, for years but could not understand who was fighting who and where and why until by chance I ran across this one by the author of Forest Gump. Then I knew--at last here was some one could write and explain--with out getting lost in HQ (headquarters) minutiae: TACTICS AND STRATEGY-- and anecdote this tragic event. We need more writers writing history. I've read so many books by BIG NAME college prof's PHD's WHO CAN'T WRITE. When I finish the ordeal I'm more confused than when started They're just good for research. Get the PHD's out of the "newspaper office" and get the gumshoes back who have a nose for history and can write, write, write--it's something you're born with like the body of a great prize fighter. 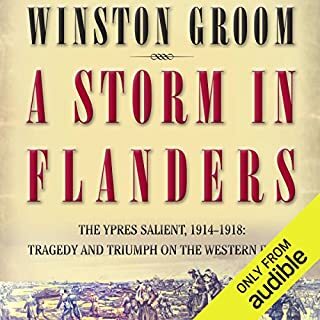 AUDIBLE--PLEASE INCLUDE MAPS FROM THE BOOK THAT I CAN DOWNLOAD. Mara Nichols, a successful lawyer, and devoted wife and adoptive mother, has recently been diagnosed with a terminal disease. Scott Coffman, a middle school teacher, has been fostering an eight-year-old boy while the boy’s mother serves a jail sentence. 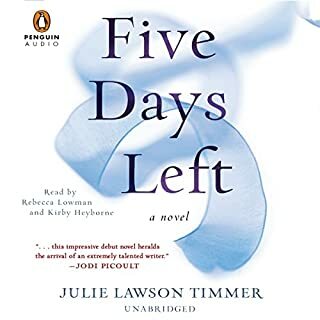 Scott and Mara both have five days left until they must say good-bye to the ones they love the most. Yes. I gave it mostly 5 stars because Mara the HD victim and Scott's pregnant demanding wife were so well done. Mara--get rid of everybody else, but for Scott's wife--and this would be a five star novel. Which character – as performed by Rebecca Lowman and Kirby Heyborne – was your favorite? Who was the most memorable character of Five Days Left and why? I don't know why modern women novelists can't create good realistic male characters. Two dimensional (ripped, handsome dark haired, blue eyed) Dr. Tom and Teacher Scott are so noble I felt they should both be awarded the Medal of Honor at the end.But Harry the aftershave, mouthwash smelling cab driver made up for both cutouts.